Wouldn't work. Solar wind comes in at a significant angle from the Sun, not a straight line. Is this stuff that's being talked about peer-reviewed? Is there a paper anywhere I can check out? So they're looking at a hydrogen-with-a-bit-of-helium atmosphere for Mars (aka, solar wind)? When you start adding oxygen, that would be kind of... what's the word I'm looking for here... ah yes, "explosive" (Really, though, in practice, I'd just expect any produced oxygen to be consumed by the hydrogen as fast as it's made). Or do they mean the atmosphere comes from somewhere else, and they're just blocking stripping? If they're talking solar hydrogen, I'd think that would be much more interesting for Venus. Large amounts of added hydrogen would result in the Sabatier reaction, simultaneously consuming Venus's carbon dioxide and creating seas. Bonus points if the tech can inject hydrogen in a manner that imparts relevant angular momentum (doubtful). But not having a paper to look at, I have no clue what technology exactly is being proposed. @Robobeat: Interesting comment - as I've never looked into solar wind anisotropy, I generally just assumed that within the heliosphere, when not modified by solid objects, it was relatively isotropic due to the high particle energy (aka not prone to being distorted by gravity). If there is a relevant anisotropic component, surely it's far less than the anti-sunward component, is it not? I should read up more on this. Of course, if you're creating a magnetic field then you're going to be creating a magnetosphere, with a magnetotail (presumably the goal is to have Mars within the magnetotail). Any particles moving sideways would be affected by this, experiencing Lorentz force as they cross the field lines there just as they would any other magnetic field lines. Note that as per the slides the point of the shield is to prevent stripping. But it's not clear whether it's also supposed to impart solar hydrogen and helium, or if not, where exactly the atmosphere is supposed to come from. Somehow I doubt that's what's being referred to here. They must just be talking about how much atmosphere would accumulate from Mars itself when you stop stripping. Could it really be that fast? Even if so, Mars has had its nitrogen stripped long ago, so I'm not sure where one could get a replacement. Now that has however gotten me curious... what would be needed to capture solar wind? Normally it's more of an erosive process than a depositional one. searching for "solar wind" and "capture" on Google Scholar mainly leads me to papers talking about how "this model captures the details of the solar wind..." and things like that. Has anyone seen any papers on the subject? I can find a good number of papers talking about natural precipitation of solar wind ions, but nothing about enhanced precipitation. The hardest part of Venus terraforming concepts is getting it moist again - aka, importing obscene amounts of hydrogen. While clearly hundred year timescales might be overly ambitious, timescales 1-3 orders of magnitude longer might be plausible. But it's just speculation unless someone has studied it. How much power is needed to generate such a field? What's the means of generating and distributing such a field? Large magnetoplasma? Or how about a large swarm of laser-formation flying satellites with superconductive coils? Or just a big, spinning superconducting coil structure. Anyway, this whole idea wouldnt work because the solar wind comes in at a large angle (45 degrees?) at Mars. ... because the solar wind comes in at a large angle (45 degrees?) at Mars. From this article: https://www.nasa.gov/press-release/nasa-mission-reveals-speed-of-solar-wind-stripping-martian-atmosphere, Mars loses about 100 g of atmosphere per second. If you could tune that down to zero somehow, and assuming all the atmospheric sources on Mars are in equilibrium with loss, you would just gain 0.1 * 86400 * 365 = 3 million kg per year. 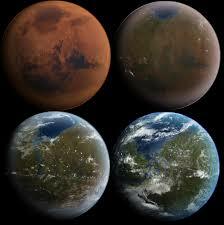 The total mass of the Atmosphere or Mars is about 2.5 x 10^10 million kg. So I don't understand where that suggestion ("500 mbar in 5 years") is coming from. Also, how does it square with the suggestion that higher pressures than 50 mbar are unstable? A bit more context would be nice. Well, that conference abstract/paper provides a bit more context. It doesn't say much about how long all that takes (except that it will be studied), so that "years, not centuries" seems to be some sort of (optimistic) extrapolation/guess. Quite vague, especially the part on the "new equlibrium". But it is quite remarkable that a temperature change of only 4 K would be enough to start melting the polar caps and resulting in a higher atmospheric pressure as a consequence. It looks like the idea is to stop solar wind erosion so that outgassing from crust/interior will start increasing atmospheric pressure/temperature. Once temperature has increased 4 K, polar caps should start melting and atmospheric density should increase rapidly(?). However, current outgassing rate seems so low that even if the solar wind erosion were stopped completely, it would take a long time (certainly more in the centuries than years) before there would be any appreciable change in the atmosphere. There would probably be a positive feedback so that even a small increase in temperature would increase outgassing, but I'd like to see some kind of quantitative estimate of this. Otherwise is feels just silly to talk about achieving this 'in a lifetime'. Of course, one could always help bring the warming about with some super-greenhouse gases. But this is true regardless of whether there is an artificial magnetic field or not. Long-term loss of an atmosphere thick enough to sustain humans is not a big issue, as it should be very slow, at least, compared to human time-scales. There seems to be an assumption that Mars is still outgassing so that if solar wind ablation is reduced total atmospheric mass increases. I was wrong. At worst, it comes in at about 10 degrees at Earth. Also, the Earth's magnetotail is wide, such that Earth-Sun-L2 is usually inside the magnetotail. The interplanetary magnetic field (embedded in the solar wind), however, is at 45 degrees, and that is the rough direction tha solar energetic particles come at. Surely Coronal Mass Ejections come directly from the sun though? By preventing those from reaching Mars (how much energy would that take? ), this would stop most of the atmosphere loss, no?